So, we have now come to the end of the build and this Francis Rossi Live Aid replica is now finished. I hope that the blog has been useful and that there is enough information here for you to go and build your own Francis Rossi replica. The most important thing when embarking on a project like this is research and attention to detail. It’s worth taking the time to really study all of the little details so that you can recreate them accurately. Taking this approach to all aspects of the build will ensure an overall authenticity which cannot be achieved be any other means. 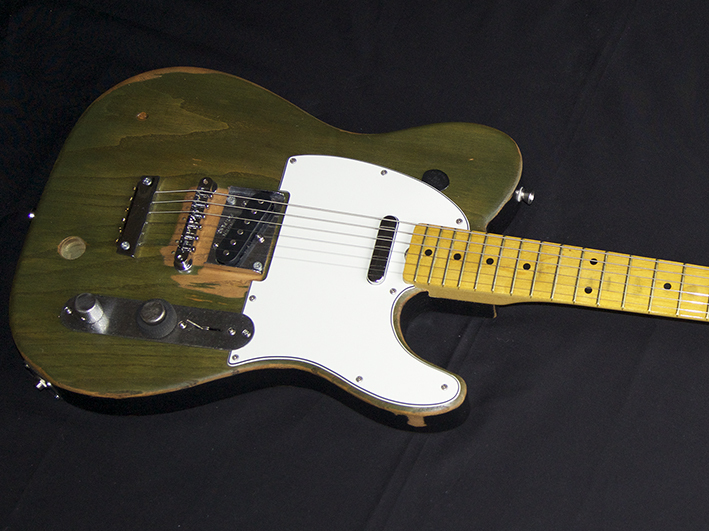 There will be further Francis Rossi guitar builds on this blog in the future. Please check back regularly for updates if you are interested in following the progress of another build. Many thanks to everyone who has followed this blog as the build has progressed through to completion and a very special thanks to Status Quo who have linked to this blog from their official website. 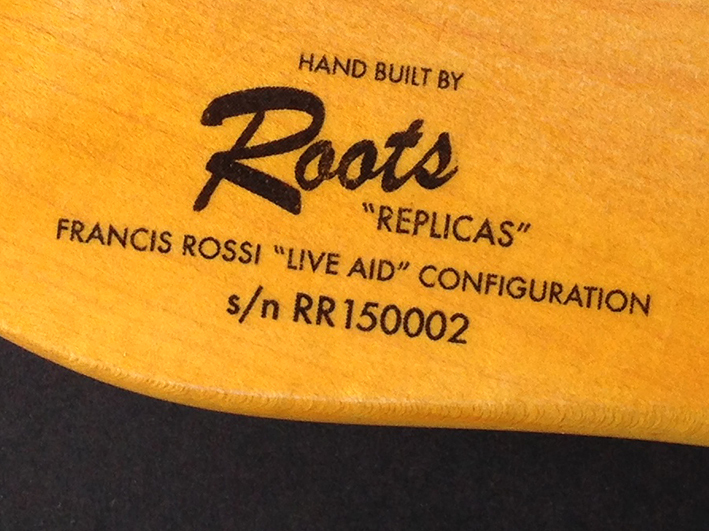 This Francis Rossi replica guitar (s/n RR150002) has now been sold. If you see the guitar for sale on or after 1st November 2015 it is being resold by a third party and not by me. If you have been directed to this blog via a link from an online and/or other sale or auction then the seller is referring you here and using this blog to assist their sale and/or auction without my consent. 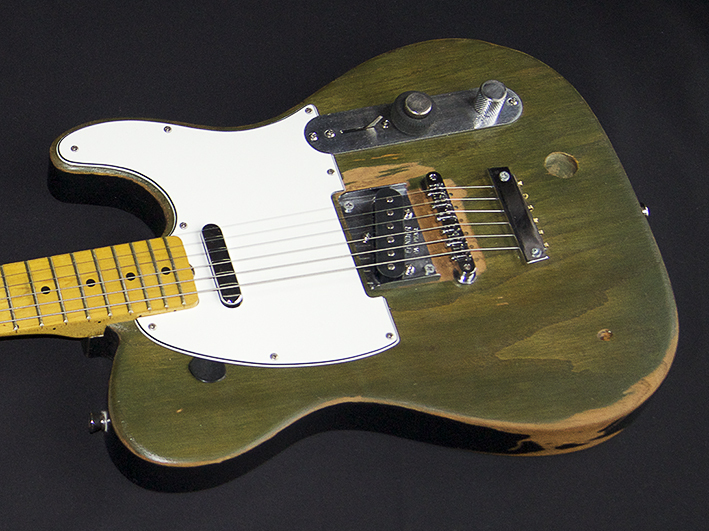 Hi, I’ve just read through your blog on how you made the Francis Rossi guitar, it looks fantastic! 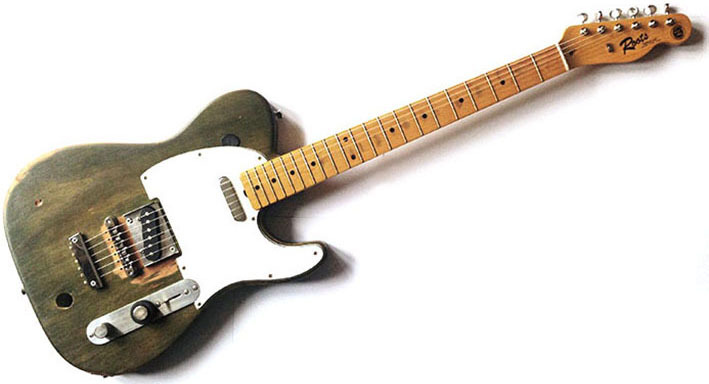 I’ve always wanted an accurate replica like this in the 70’s configuration, the sound of those guitar solos on the 70’s albums is my all time favourite guitar tone by far! I was wondering do you make these to order, or do you sell them at all? As I would be really interested in buying one if you did? Hi David, many thanks for your comments and I’m glad you enjoyed following the blog. Owing to the length of time it takes to build and also the amount of detailed work involved, I only make one Francis Rossi Live Aid guitar per year. I am planning to build one this year and I currently have a buyer lined up, but if that should change for any reason, details of the sale or auction would be posted on the News page. 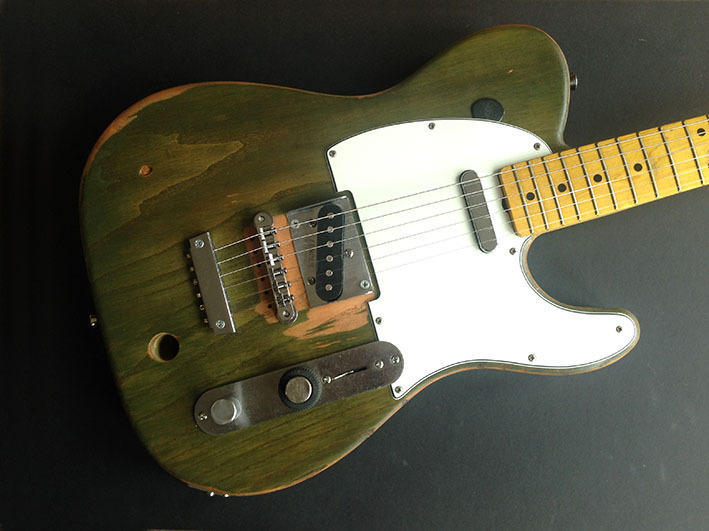 Hi, that’s ok, thanks for your reply, I was thinking of trying to build my own as a personal project, but the thing that confuses me is how to get the neck to sit right with the tune o matic bridge, as I presume the tune o matic is a lot higher than a Tele bridge? Would you be able to explain how you managed to do this with your guitar? It be really helpful if you could? You could rebate the bridge into the guitar body by routing out the entire shape so that you can fit the whole assembly into a sunken position, thereby lowering the entire bridge. 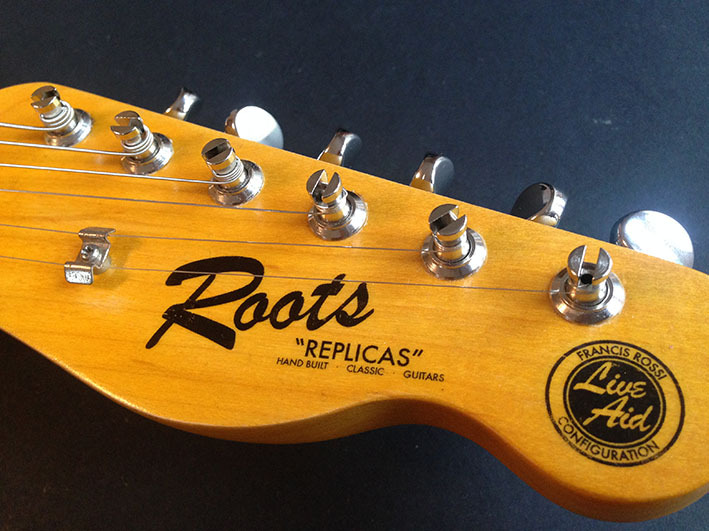 Or, you could shim out the neck so that it leans slightly back toward the player (like a Gibson) which creates a lower action where the strings break over the heel of the neck. 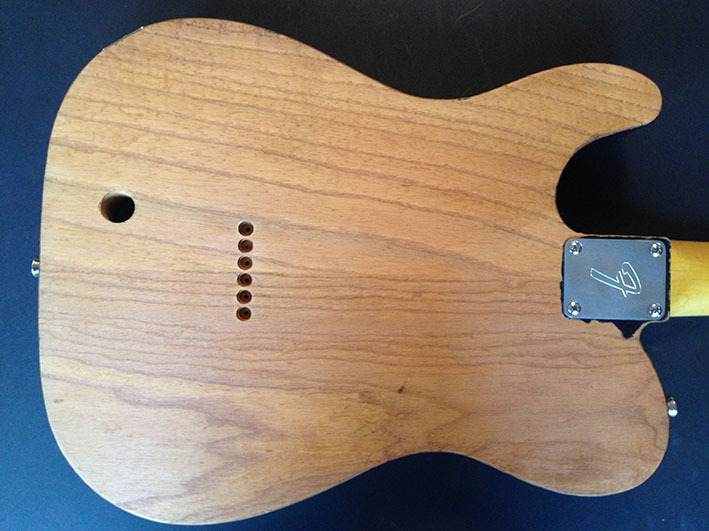 Shimming out ideally needs to be done with a single, very thin, but essentially wedge-shaped piece of wood, which covers the entire connecting surface of the neck pocket. I’m sure there are plenty of tutorials online detailing how to do the above, but it’s probably best to get a professional Luthier carry out the work for you.